Wind energy supply has grown rapidly over the last decade. However, the long-term contribution of wind to future energy supply, and the degree to which policy support is necessary to motivate higher levels of deployment, depends—in part—on the future costs of both onshore and offshore wind. In this study we summarize the results of an expert survey of 163 of the world’s foremost wind experts, aimed at better understanding future costs and technology advancement possibilities. Three wind applications were covered: onshore (land-based) wind, fixed-bottom offshore wind, and floating offshore wind. Results are summarized in the “infographic” below. Under the median scenario, experts anticipate 24%–30% reductions by 2030 and 35%–41% reductions by 2050 across the three wind applications studied. In absolute terms, onshore wind is expected to remain less expensive than offshore, at least for typical projects—and fixed-bottom offshore less expensive than floating offshore wind. 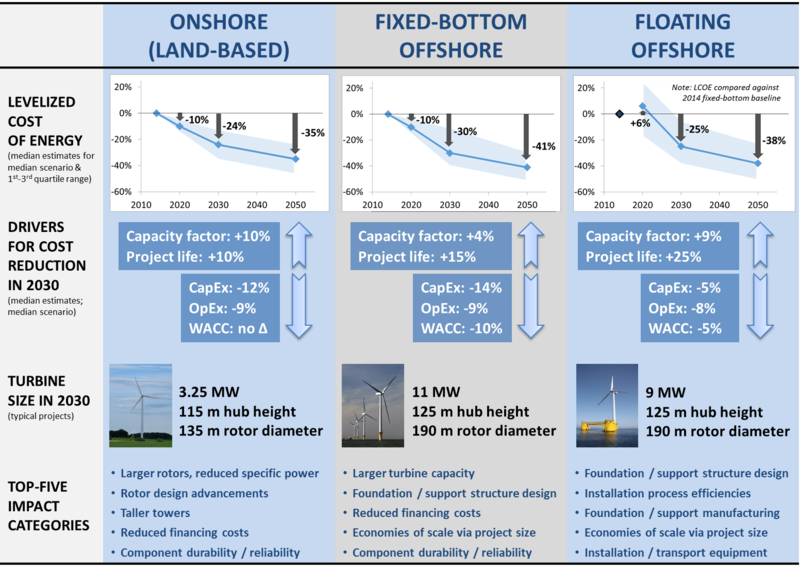 But there are greater absolute reductions in the levelized cost of energy for offshore wind compared with onshore wind, and a narrowing gap between fixed-bottom and floating offshore. Costs could be even lower: experts predict a 10% chance that reductions will be more than 40% by 2030 and more than 50% by 2050. Learning with market growth and aggressive R&D are noted as two key factors that might drive towards this ‘low cost’ scenario. There is substantial uncertainty in these cost projections, illustrated by the range in expert views and by the ‘high cost’ scenario in which cost reductions are modest or non-existent. Experts anticipate continued improvements in up-front costs and capacity factors, as well as reduced operating costs, longer project design lives, and reductions in the cost of finance, with the relative impact of each driver dependent on the wind application in question. Published literature that focuses exclusively or primarily on up-front capital costs may understate wind energy cost-reduction potential. Turbine size is expected to continue to increase, both onshore and—especially—offshore, with a large number of additional advancement possibilities noted. Overall, insights gained through the expert survey complement other tools for evaluating cost reduction potential, and can help inform policy and planning, R&D, and industry strategy. The survey instrument that was used for the expert elicitation during the months of October and November 2015 is available here (link). A discussion of our definition of the levelized cost of electricity (LCOE) can be found here (link). A discussion of our definition of a "typical project" in future years can be found here (link). The online LCOE calculator that was available to experts while responding to the survey can be found here (link). A currency translator that was available to experts while responding to the survey can be found here (link).